The tail from an Air Malaysia plane crash lies in a wheat field on July 18, 2014 in Grabovo, Ukraine. Malaysia Airlines flight MH17 travelling from Amsterdam to Kuala Lumpur has crashed on the Ukraine/Russia border near the town of Shaktersk. The Boeing 777 was carrying 298 people. 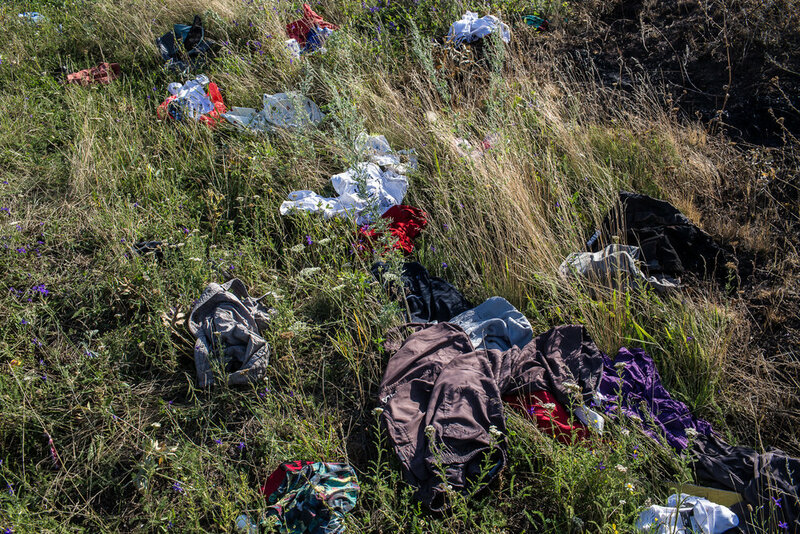 A man looks at debris from the crash of Malaysia Airlines flight MH17 on July 18, 2014 in Grabovo, Ukraine. Malaysia Airlines flight MH17 travelling from Amsterdam to Kuala Lumpur has crashed on the Ukraine/Russia border near the town of Shaktersk. The Boeing 777 was carrying 298 people. The body of a victim of the crash of Malaysia Airlines flight MH17 lie in a field on July 18, 2014 in Grabovo, Ukraine. Malaysia Airlines flight MH17 travelling from Amsterdam to Kuala Lumpur has crashed on the Ukraine/Russia border near the town of Shaktersk. The Boeing 777 was carrying 298 people. 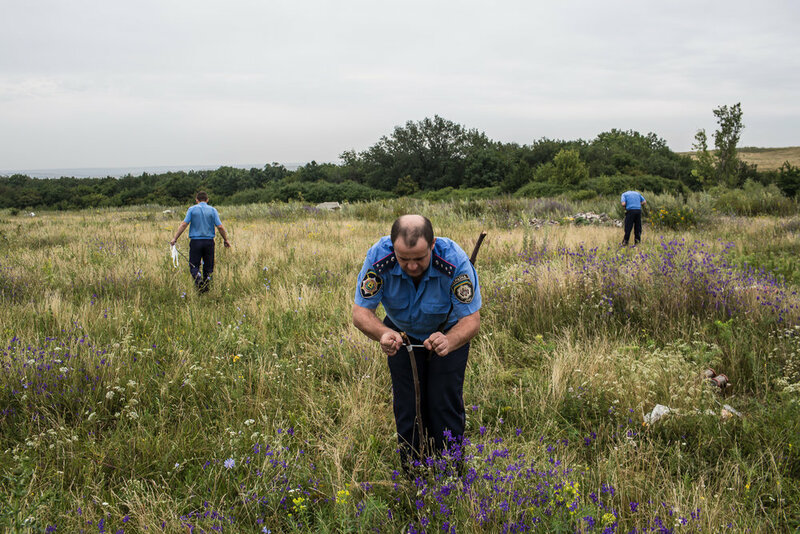 A Ukrainian Emergencies Ministry worker ties a white ribbon to a stake to mark human remains found in a field after a commercial passenger plane was shot from the sky by a missile the previous day on July 18, 2014 in Grabovo, Ukraine. Malaysia Airlines flight MH17 travelling from Amsterdam to Kuala Lumpur has crashed on the Ukraine/Russia border near the town of Shaktersk. The Boeing 777 was carrying 298 people. A boarding pass from a previous flight, belonging to a passenger on Malaysia Airlines flight MH17, on July 18, 2014 in Grabovo, Ukraine. Air Malaysia flight MH17 travelling from Amsterdam to Kuala Lumpur has crashed on the Ukraine/Russia border near the town of Shaktersk. The Boeing 777 was carrying 298 people. 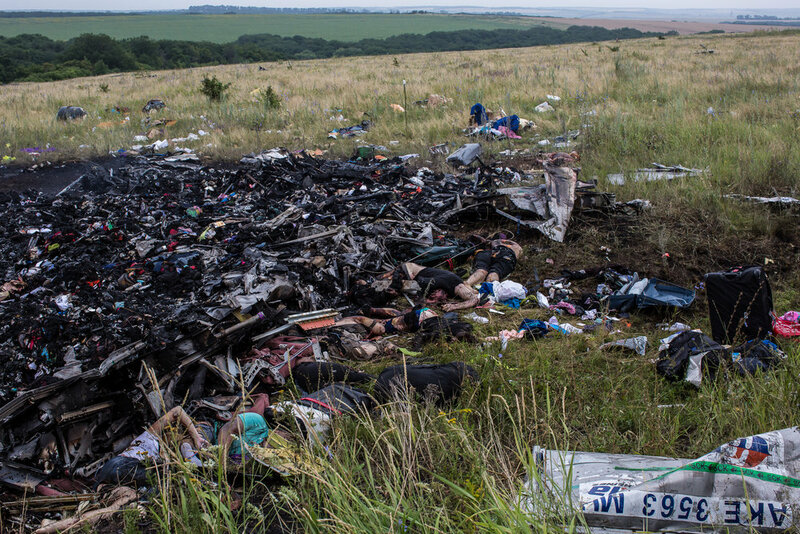 The body of a passenger on Malaysia Airlines flight MH17 lies at the edge of a road on July 18, 2014 in Grabovo, Ukraine. The flight, traveling from Amsterdam to Kuala Lumpur, crashed on the Ukraine/Russia border near the town of Shaktersk. The Boeing 777 was carrying 298 people. A group of off-duty coal miners searches a wheat field looking for remnants of Malaysia Airlines flight MH 17 on July 19, 2014 in Grabovo, Ukraine. The flight was traveling from Amsterdam to Kuala Lumpur when it crashed killing all 298 on board including 80 children. The aircraft was allegedly shot down by a missile and investigations continue over the perpetrators of the attack. A group of coal miners takes a break after searching fields looking for remnants of Malaysia Airlines flight MH 17 on July 19, 2014 in Grabovo, Ukraine. Malaysia Airlines flight MH17 was travelling from Amsterdam to Kuala Lumpur when it crashed killing all 298 on board including 80 children. The aircraft was allegedly shot down by a missile and investigations continue over the perpetrators of the attack. 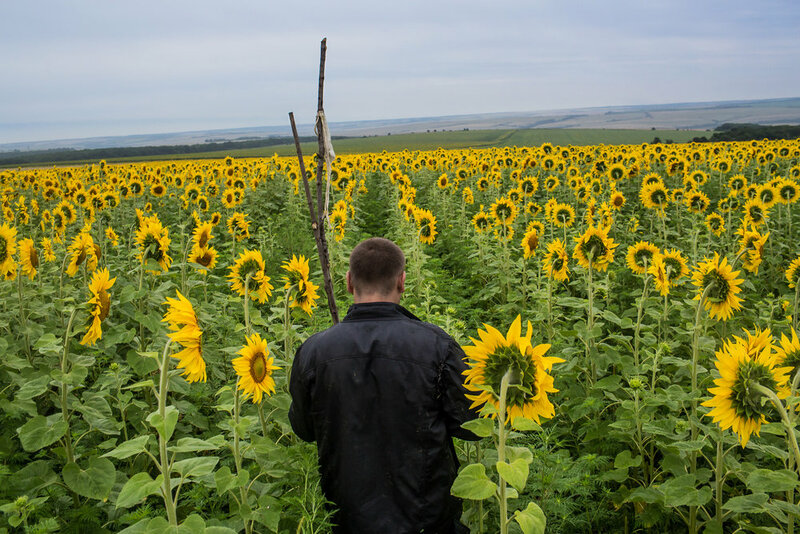 An off-duty coal miner searches a field for debris and human remains from the crash of Malaysia Airlines flight MH17 on July 18, 2014 in Grabovo, Ukraine. The flight, traveling from Amsterdam to Kuala Lumpur, crashed on the Ukraine/Russia border near the town of Shaktersk. The Boeing 777 was carrying 298 people. 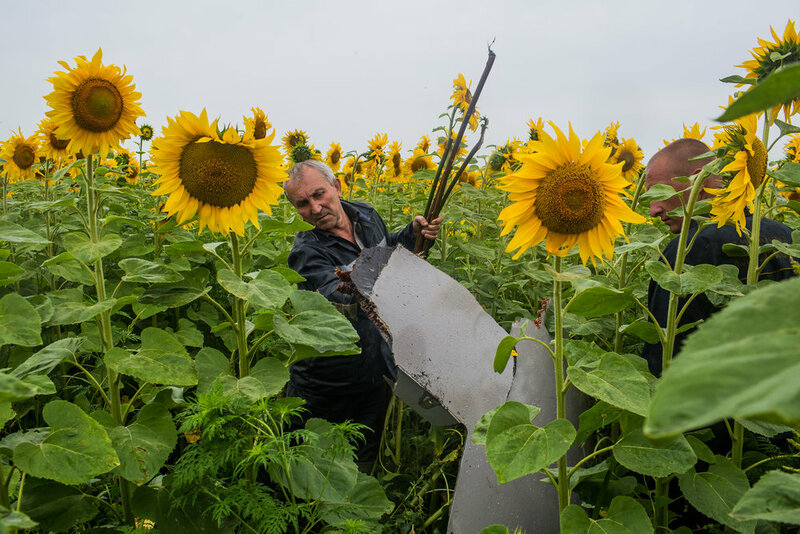 Off-duty coal miners inspect a piece of debris found in a field from the crash of Malaysia Airlines flight MH17 on July 18, 2014 in Grabovo, Ukraine. The flight, traveling from Amsterdam to Kuala Lumpur, crashed on the Ukraine/Russia border near the town of Shaktersk. The Boeing 777 was carrying 298 people. Local residents gather to watch as the bodies of victims of Malaysia Airlines flight MH17 are removed from the scene of the crash on July 21, 2014 in Grabovo, Ukraine. Malaysia Airlines flight MH17 was travelling from Amsterdam to Kuala Lumpur when it crashed killing all 298 on board including 80 children. The aircraft was allegedly shot down by a missile and investigations continue over the perpetrators of the attack. 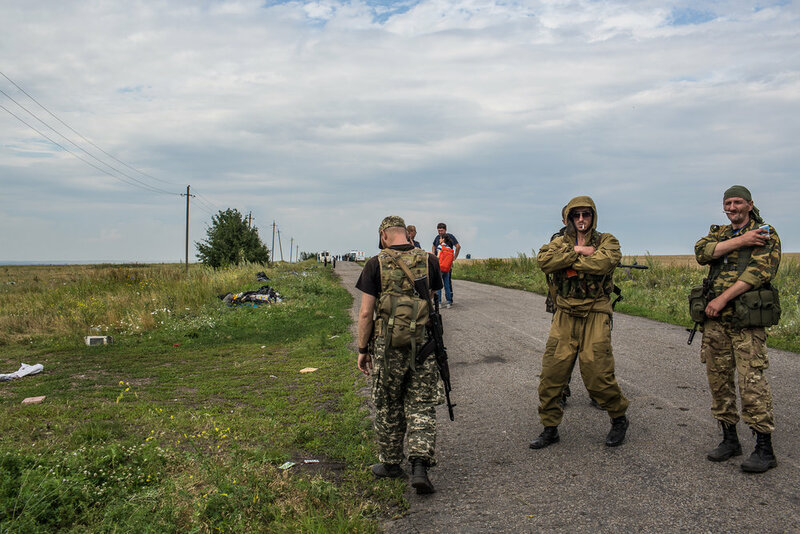 Pro-Russia rebels guard the site of the crash of Malaysia Airlines flight MH17 on July 19, 2014 in Grabovo, Ukraine. Malaysia Airlines flight MH17 was travelling from Amsterdam to Kuala Lumpur when it crashed killing all 298 on board including 80 children. The aircraft was allegedly shot down by a missile and investigations continue over the perpetrators of the attack. 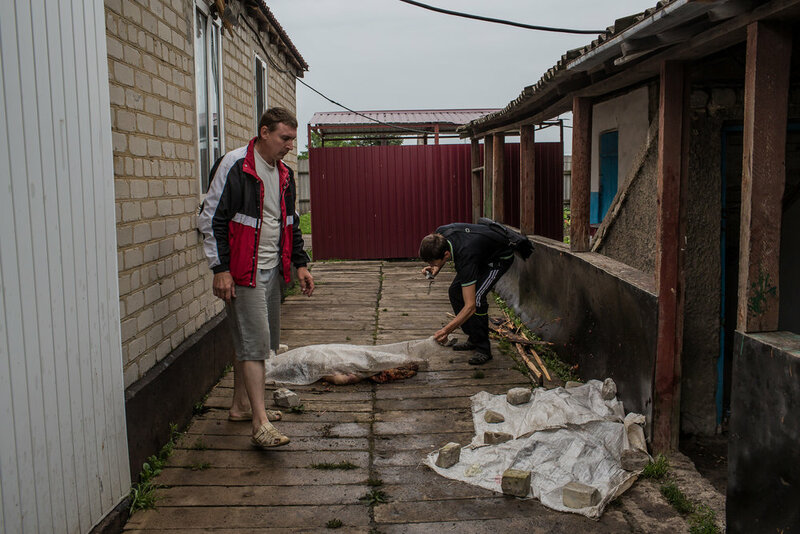 Men show the bodies of passengers from an Air Malaysia plane which landed next to a house on July 18, 2014 in Rassipnoye, Ukraine. Malaysia Airlines flight MH17 travelling from Amsterdam to Kuala Lumpur has crashed on the Ukraine/Russia border near the town of Shaktersk. The Boeing 777 was carrying 298 people. The bodies of victims of the crash of Malaysia Airlines flight MH17 lie in a field on July 18, 2014 in Grabovo, Ukraine. The flight, traveling from Amsterdam to Kuala Lumpur, crashed on the Ukraine/Russia border near the town of Shaktersk. The Boeing 777 was carrying 298 people. 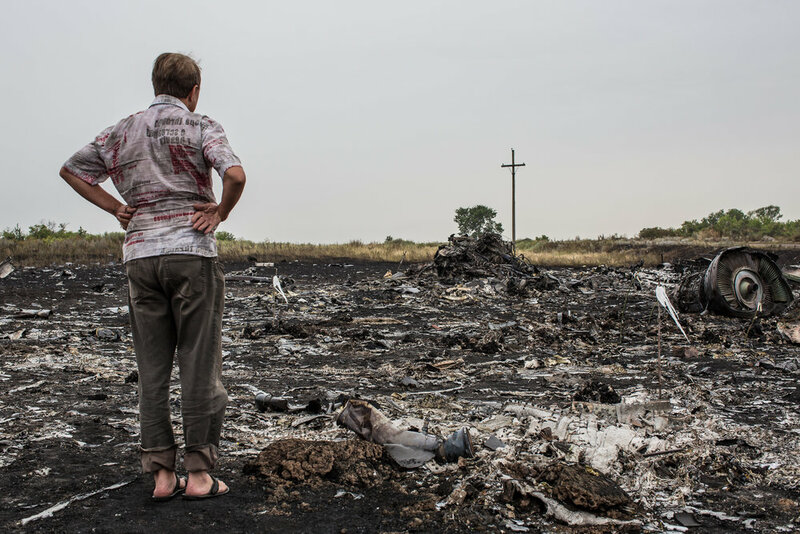 The bodies of victims of the crash of Malaysia Airlines flight MH17 lie among burned wreckage in a field on July 18, 2014 in Grabovo, Ukraine. Air Malaysia flight MH17 travelling from Amsterdam to Kuala Lumpur has crashed on the Ukraine/Russia border near the town of Shaktersk. The Boeing 777 was carrying 298 people. 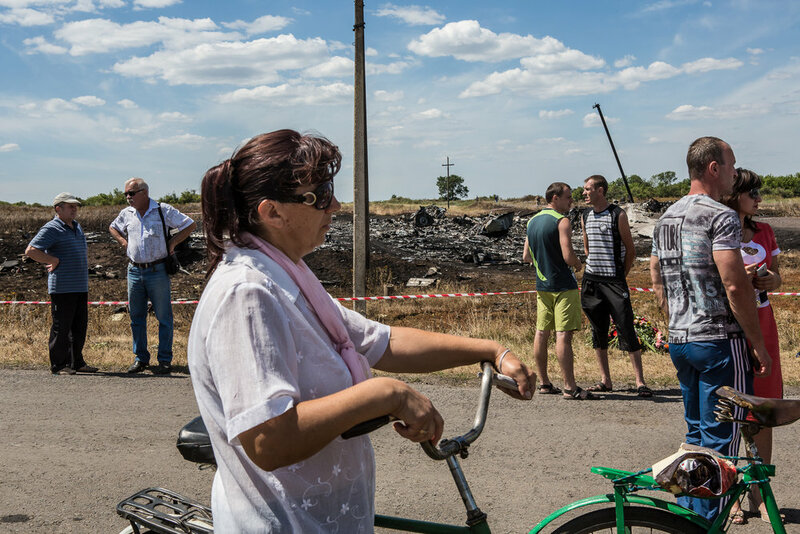 Local residents gather to watch as the bodies of victims of Malaysia Airlines flight MH17 are removed from the scene of the crash on July 21, 2014 in Grabovo, Ukraine. The flight was traveling from Amsterdam to Kuala Lumpur when it crashed killing all 298 on board including 80 children. The aircraft was allegedly shot down by a missile and investigations continue over the perpetrators of the attack. Personnel from the Ukrainian Emergencies Ministry load the bodies of victims of Malaysia Airlines flight MH17 into a truck at the crash site on July 21, 2014 in Grabovo, Ukraine. Malaysia Airlines flight MH17 was travelling from Amsterdam to Kuala Lumpur when it crashed killing all 298 on board including 80 children. The aircraft was allegedly shot down by a missile and investigations continue over the perpetrators of the attack. On July 17, 2014 Malaysia Airlines flight MH17 was shot down by a surface-to-air missile as it passed over eastern Ukraine en route from Amsterdam to Kuala Lumpur, killing all 298 people on board. Immediate suspicion, backed up by on-the-ground evidence and analysis from Western intelligence agencies and international investigators, implicated the pro-Russian rebels currently fighting a war in the region, who seemingly received the weapon directly from Russia. While it is most likely that the commercial passenger jet was mistaken for a military plane, the immediate effect is to make clear the global consequences of this conflict.